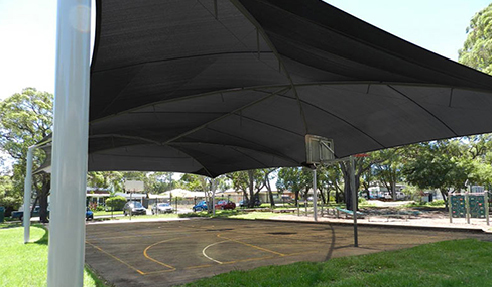 Comshade is a proven and trusted heavy duty knitted shade cloth designed for large tension shade structures and sails. Its exceptional strength to weight ration makes Comshade, ideal for larger commercial projects, where the shade cloth fabric is exposed to the harsh environmental conditions of wind, rain, hail, dust and UV exposure. Comshade Xtra® complements the existing ranges of extra heavy duty knitted shade cloth. This innovative collection of shade cloth has been developed using the very latest knitting and yarn technology to minimise the fabric weight whilst also maximising the extremely high fabric tear and tensile strength. Architec 400 is an extra heavy duty knitted shade cloth designed for large commercial tension structures and shade sails. Manufactured to strict quality control standards, the unique construction features a combination of monofilament yarn and the propriety Ovalon monofilament yarn. Architec 400 offers up industry-leading UVR protection up to 96.5%. 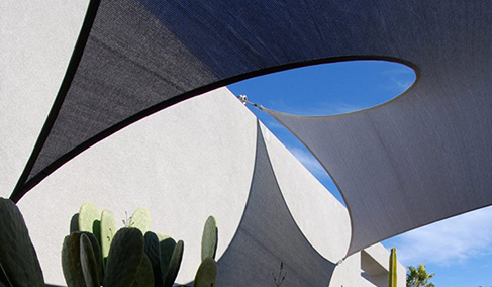 PolyFX shade cloth is ideal for small to medium domestic and commercial shade sails and structures plus offers the end users maximum Ultra Violet Protection against the strong UV rays of the sun. The 19 contemporary colours combine with a 10-year warranty for a perfect cloth solution. Head over www.nolans.com.au to learn more about the commercial people shade cloths today. I would like to enquire about Nolan Group.